When The Old World met it's end I admit I was a bit sad to see the passing of the setting I had known for decades. 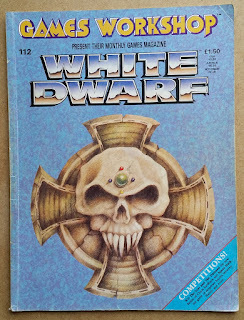 On the other hand it was hard to get annoyed or really muster up more than an 'hmm, that's a shame' as it had been a long time since I had played Warhammer Fantasy Battle or do more than read the old Warhammer story. 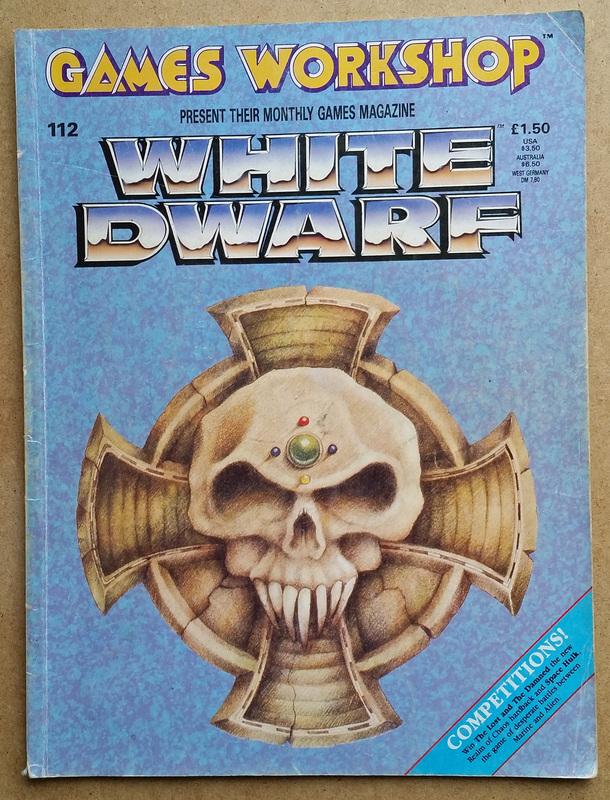 The fact was 40k had a much bigger hold on me and I had long stopped having an interest in playing the game, all those massed ranks really didn't appeal to me in the slightest. So when Age of Sigmar came along I didn't pay it much notice. The new setting didn't really grab me, but then there was very little put out about the setting that could hook me in. However I did look on many of the new releases favourably, some of the new lines are stunning...but not enough to tempt me into a new army. However as Fantasy has round bases I could use my Daemons as a dual force to try the game out. 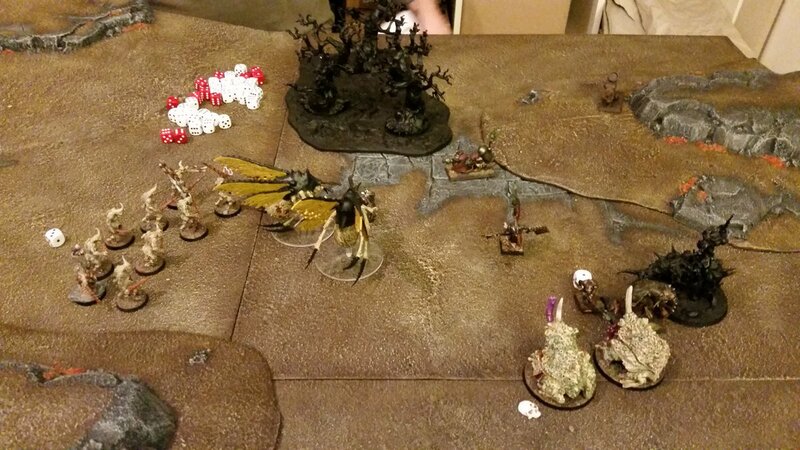 This week passed the Daemons took to the field in a very small game against some Skaven. In hindsight the two forces (based on wounds) were not balanced, but as this really was just to pick up the rules and get a feel of the thing the outcome wasn't really important. 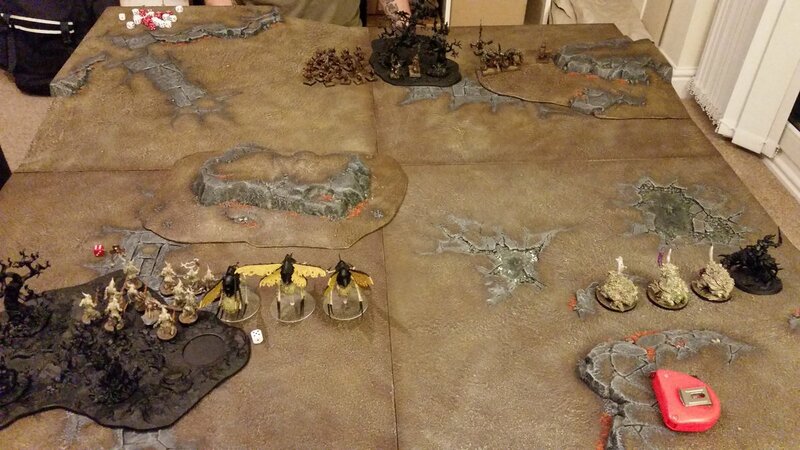 Above is the two armies set up. It was a simple 'kill as much as you can' game. Should have got some in game shots...but I didn't. 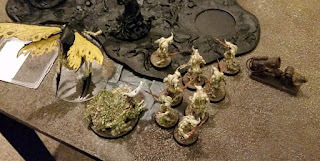 Below are the Daemons moving in for the kill after the rest of the rats had been seen off. 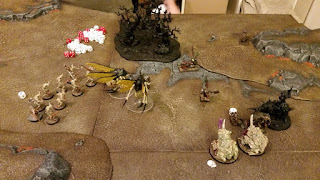 That warpflame thrower team was the star for the rats as it took out eight plaguebearers. It was nice for the first time to use the Plague Toads as actual Plague Toads as Forge World has never done 40k rules for them (maybe one day). Below is the death toll, everything the Deamons killed - so the entire Skaven force bar one model (see the next picture). Star of the rat force, after the flamer team, was the Clan rat standard bearer who survived being attacked by about ten plaguebearers. In fairness he then got eaten by a Plague Drone. And the next picture is everything killed by the Skaven. 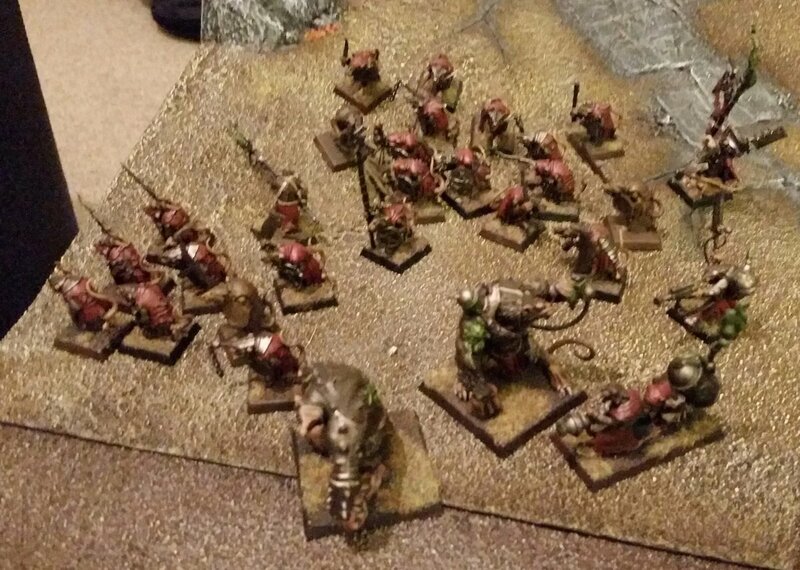 This includes the Skaven mortar team who after missing every single shot blew themselves up. It was a truly impressive performance by them. And finally the victors left on the field. That bloody Herald did nothing other than chase after everyone. We both enjoyed the game alot. We found, even with us having to look up rules, quick and it flowed well. There are lots of things I thought worked well and it makes me more confident in the changes GW any thinking of doing to 40k for 8th Edition. I am now thinking about adding some AoS only units to the force. I've actually got some time to spend on hobby stuff. 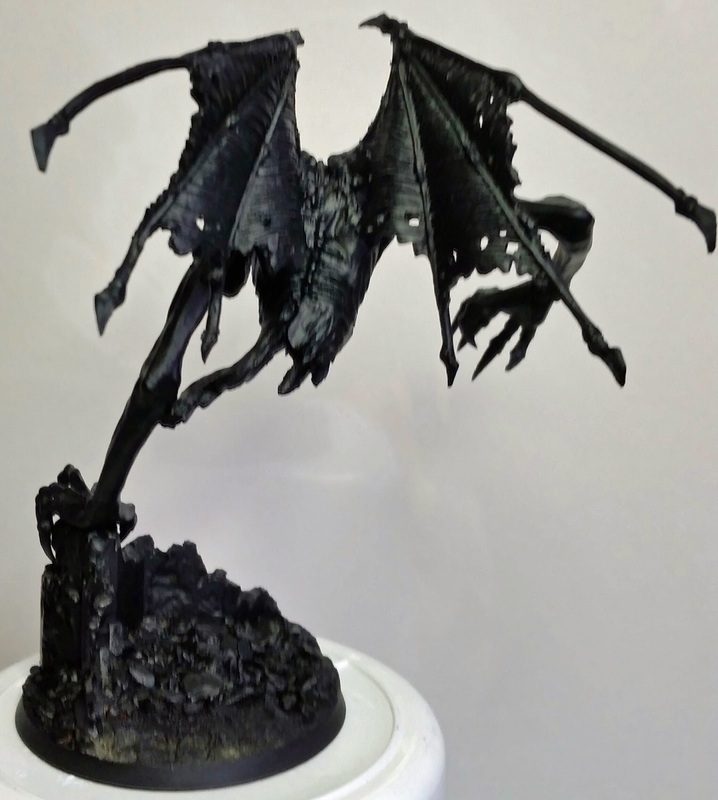 So in a bid to get some projects to completion (or at least completed stages) I got some work in on the Daemon Prince. I got the wings added and GS and other textures done. 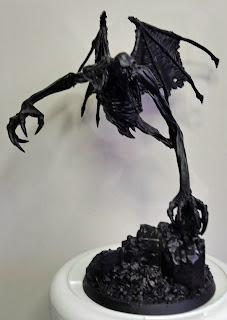 I am no sculptor but it is good enough for me. 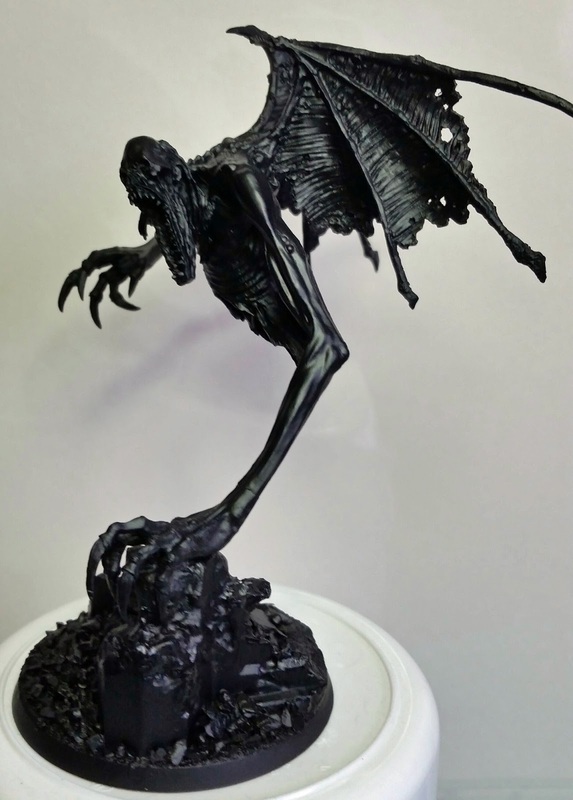 After that he got a coat or primer then a black undercoat. So he has now moved from the WIP stage to a completed build / PIP stage. 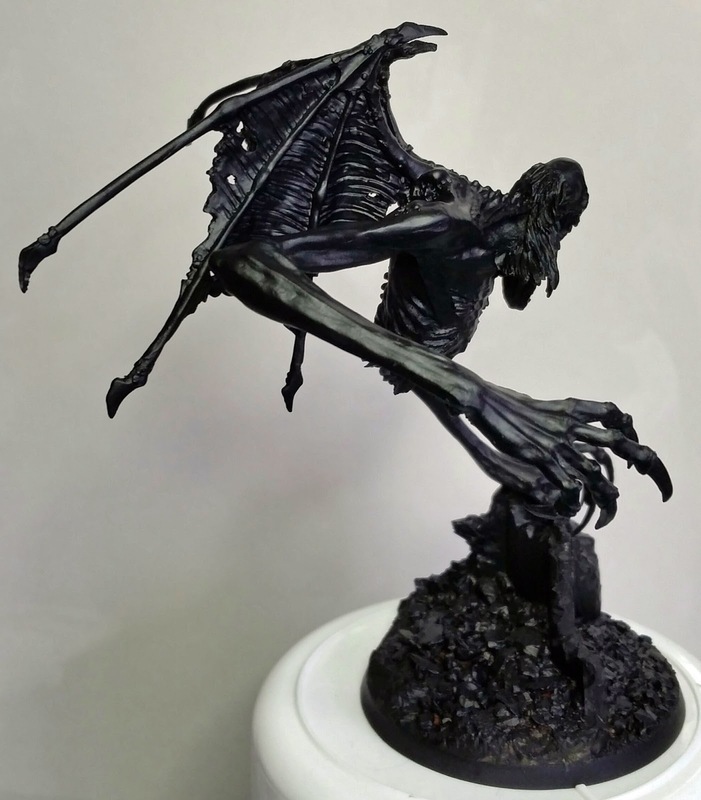 As it has been a while since I put this up here is the current state of play for the Daemons. As you can see there is no more red, everything I have is now built. There is quite a lot of green or yellow though. Except I have bought two new weapons for the Decimators off ebay. Dunno what I am going to do with them yet. Not had much time hobby wise so alas the AdMech have not progressed much since the last update, however I am finishing off an assignment which means I should have some good time to put towards hobby projects very soon.